I am a casual collector of vintage paper goods and assorted ephemera. My stash includes vintage dictionaries and encyclopedias, postcards, baby scrapbooks, and handwritten recipe files. Recently, at a Saturday morning yard sale, I scored a different type of collectible—a Wills’s Cigarette Picture Card Album filled with 50 “Household Hints” trading cards. I was curious about my $2 find and thus launched a Google rampage. I learned that “cartophily” is the hobby of collecting cigarette cards, and so that makes me a very part-time cartophilist. Cards, originally used to simply fortify packages of cigarettes, later became vehicles for advertising and artful trading cards. W.D. & H.O Wills, a division of Imperial Tobacco, was the first tobacco company to issue sets of cards. In 1895 “Ships & Sailors” inaugurated the card craze which lasted until the early 1940s. These miniature cards measure 2 5/8 by 1 3/8”. They are numbered and each card features a colorful printed letterpress image on the front and a directive or explanation on the reverse. The first series appealed to men who were the majority smokers, and sporting themes like cricket and baseball were very popular. Soon enough, sets featuring garden flowers, movie stars, birds, and British butterflies would appeal to either gender. According to Colin Fawcett, Membership Secretary for The Cartophilic Society of Great Britain, a group of nearly 1,000 members devoted to propagating, enhancing, and preserving the hobby of cigarette card and trade card collecting, “Household Hints” was first issued in 1927 and there were several other incarnations up until 1936. The rarest cards, if in very good condition, can fetch a handsome price. A top-rated eBay seller known as Cigarette Cards is presently selling a 1901 set of 50 locomotive cards for $571 and a set of 32 Drum Horses from 1901 for $233. Household Hints, which Colin informed me was quite common, has a starting bid of just one cent. Alas, I will not make a mint from reselling it! I am perfectly happy with my purchase nonetheless. I love the quaint illustrations, the 115-word DIY tips, and the diligence of the smoke. 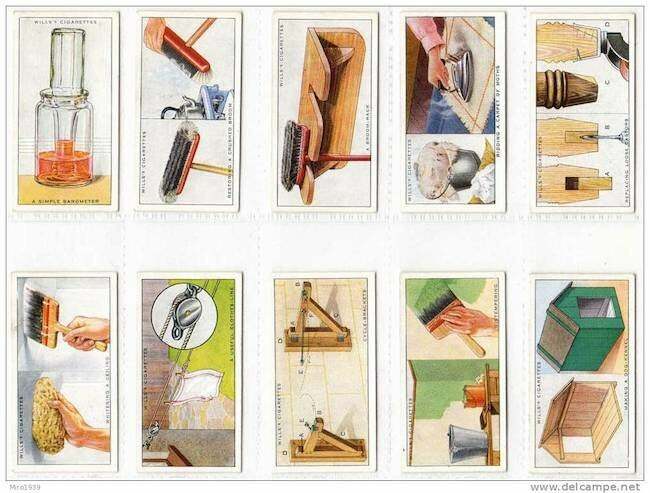 If you would like to see the backs and fronts of every single Household Hints card (or if you should need some old-fashioned assistance in cleaning pewter or clearing choked rain pipes), see a completely photographed book here.